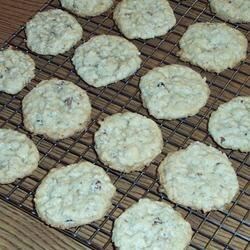 "Wholesome high fiber cookies with coconut, oats and nuts. When they are gone, you will be howling for more." Preheat oven to 350 degrees F (175 degrees C). Grease baking sheets. In a medium bowl, cream together the butter, white sugar and brown sugar. Beat in the egg and vanilla. Combine the flour, oats, baking soda, baking powder and salt; stir into the wet mixture until just blended. Finally, fold in the pecans and coconut. Dough may be a little dry. Shape dough into walnut sized mounds and place 1 1/2 inches apart on the prepared cookie sheet. Bake for 12 to 14 minutes in the preheated oven, or until golden. Cool on baking sheets. I followed the recipe and ended up with a thin mess. There was nothing dry about the dough! The only bad thing about these cookies is that I don't feel guilty about eating them, so it's hard to stop! They're wonderful high-fiber cookies that make a good afternoon snack. Very easy to make and came out great. They're not overly sweet and have a very good taste and texture. The recipe says it makes 3 dozen, but I ended up with 5 dozen, and that's a good thing!! I needed my child to eat more fiber and I've been fighting with her constantly over this. I made these cookies for her and she never suspected my intention. They're great! Wonderful flavor. Will make again.